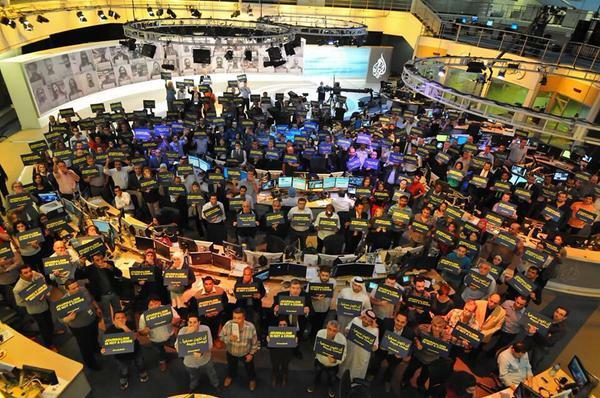 Members of the Al Jazeera staff pose for a photo to express their solidarity for their colleagues facing imprisonment in Egypt (Kamahl Santamaria photo courtesy of Twitter). Last July, I started a series of posts about my "journo-less summer" following the completion of my journalism certificate program and the first subject that I covered was the trial of three Al Jazeera journalists by Egyptian authorities regarding their activities in that country during the 2012 military takeover of the government of then-president Mohammed Morsi. He had come into power after the 2011 "Arab Spring" uprisings against long-time strongman ruler Hosni Mubarak but Morsi's Muslim Brotherhood party fell out of favor with the ruling military establishment and he and his government were deposed in a large-scale crackdown two years later. Mohammed Fahmy, Peter Greste, and Baher Mohamed, employees of the Qatar-based satellite television network, were arrested on charges of aiding a terrorist organization by broadcasting false news about the military's activities during that overthrow. All three were convicted in June 2014 to sentences of between seven to 10 years in length and an appeal process was almost immediately started in response to the verdict. This past February, Greste--an Australian--was deported to Cyprus and the others were released on bail to await the verdict of a retrial. On Saturday, all three were convicted of operating without a press license and broadcasting material that was harmful to Egypt and each received a three-year sentence (Baher was given an extra six months for having a bullet casing in his possession when first arrested). According to a June 2015 report by the Committee to Protect Journalists, Egypt's imprisonment of those trying to report the news is at historically high levels due to their believed ties to the Muslim Brotherhood political organization although some see it as retribution by those authorities who declared them to be a terrorist organization. That same month, the government passed an anti-terrorism law making any published information that contradicts the official version a criminal act and subject to prison terms, a move that further hinders that country's already restricted freedom of the press. 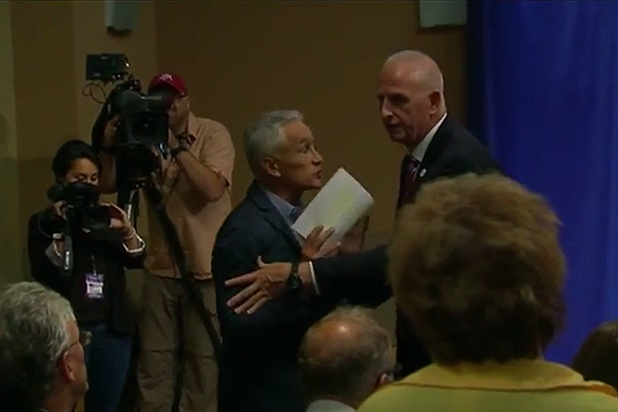 Univision news anchor Jorge Ramos, center, is escorted out of a campaign press conference held by Republican presidential candidate Donald Trump this past Tuesday in Dubuque, Iowa (video capture courtesy of Univision Noticias). While not displaying the degree of censorship seen in that aforementioned Middle Eastern country, an incident happened in Iowa last Tuesday that shows that America can sometimes be the antithesis of free speech--at least when it comes to that of the political variety. During a press event for Republican presidential candidate Donald Trump, Jorge Ramos, the anchor for the Univision Spanish language broadcast television network's Noticerio Univision nightly newscast, confronted the New York businessman regarding his now notorious comments made about Hispanics and an announced plan to build a wall along the entirety of the United States' border with Mexico. This confrontation had been months in the making and that built-up angst quickly surfaced when Ramos began to question Trump' immigration policies without being called upon first. After several barbed exchanges between the two, security escorted the anchor from the venue but he was allowed to return after 15 minutes and the two immediately restarted their contentious exchange that seemed more like each regurgitating their own talking points rather than having a meaningful dialog. American politicians and the press have had their moments over the country's 240-year history. Thought of as mostly made up of "left wingers", Republican officials normally preface any press criticisms with "liberal leaning" or "mainstream media" to their supporters to attract applause (and monetary donations). With the advent of the Fox News Channel and the near total dominance of conservative talk radio on America's airwaves, Democrats bring up "vast right wing conspiracy" to deflect any criticism from (and question the legitimacy of) those news and entertainment sources. However, it is extremely rare to see a credentialed journalist physically escorted out of a public event solely for doing their jobs (albeit, in this case, the lack of decorum and protocol from both participants was very telling). With the nearly two dozen announced and potential candidates for next year's White House run and the growing negative tenor emanating from the Republican race, there unfortunately might be other instances of such undemocratic flare-ups along the many campaign trails traversing the country. A moment of silence was held for the slain reporter and cameraman on Roanoke, Virginia television station WDBJ 24 hours after being murdered on-air by a disgruntled former employee (Steve Helber photo courtesy of the Associated Press). The final event I want to bring up is probably the hardest one to talk about because of both the heinous nature of the crime committed and the many layers of professional and social discussions it feeds into. 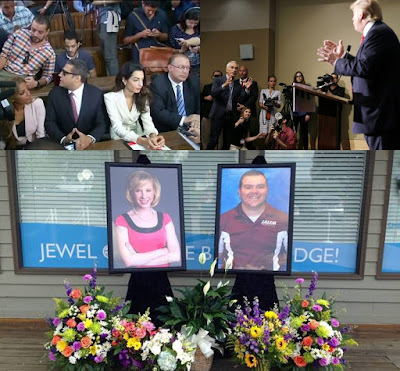 Early on Wednesday morning, during an on-air interview broadcast via the Roanoke, Virginia CBS network television affiliate WDBJ's morning show, a former station employee murdered reporter Alison Parker and cameraman Adam Ward while at a remote location in Moneta. Vester Lee Flanagan, who went by the name Bryce Williams during his television journalism career, walked up to them and waited for the camera to pan back to Parker before he shot her, Ward, and Vicki Gardner, a local chamber of commerce representative for the interview, at point-blank range. Parker and Ward died at the scene from their injuries while Gardner was expected to survive after emergency surgery for a gunshot wound to her back. Flanagan fled the scene and was the subject of a five-hour manhunt before shooting himself when confronted by law enforcement officials outside Washington, DC where he died a short time later in a Falls Church, Virginia hospital. When this news made its way to social media circles, the usual debates regarding gun violence, mental health, and Second Amendment freedoms launched with full fury. However, it was Flanagan's own use of Facebook and Twitter that provided a much more sinister element to his actions. Having been dismissed from WDBJ in early 2013 for displays of volatile behavior, he cited racial discrimination on the station's staff and called out Parker and Ward by name via those outlets. In an eerie depiction of a first-person shooter video game, Flanagan recorded his attack with his cellphone and later posted that video to his Facebook and Twitter accounts along with "tweets" about his rationale for the shooting. In a nod to more traditional communications, he also faxed a 23-page document titled "Suicide Note for Friend & Family" to catalog his perceived grievances by WDBJ staff members due to his sexual orientation and race (he was a gay African-American). Flanagan also introduced the June 2015 murders of nine members of Charleston, South Carolina's Emanuel African Methodist Episcopal church by an alleged white supremacist as well as other perpetrators of mass shootings in recent US history and cited all of them as a catalyst for his deadly actions. I served in the Air Force for over 20 years and I can probably count fewer than all the fingers on one hand the amount of times that I was in a potentially hazardous situation where I thought my life might be at risk. Back in June of 2012, I posted a story about a significant wind storm that blew threw this area and wondered how I should respond if placed in a life-or-death scenario and where my journalistic roles ended and my humanity took over but I never envisioned being in an "active shooter" situation. Over the past few years, I have been in close proximity to people assigned security details because of perceived or potential threats and not once felt scared to perform my activities in their immediate presence. By the nature of the business, news crews normally announce to the world their location and composition when they are doing their jobs. This remote team had no chance against a well-armed and mentally unstable man and the historical odds of a journalist facing that kind of threat outside of a combat zone are slim to none. One would think an early morning remote from a tranquil lakeside setting would not be dangerous but, in today's 24/7 logged-in, socially connected, and mobile technology enabled society, we now realize that a person with a grudge--and a death wish--can change that in mere seconds.